WANT TO SPEND IT CLOSE TO THE BEACH? HOW ABOUT SERVING IN A SOUTHERN COMMUNITY? Look no further! We will be sending a group of 10 UW students on a spring break trip to Summerdale, Alabama. After working, usually 9-2 each day, grab your swimwear and head to Alabama's pristine white sandy beaches. You'll be working within 20 minutes of the beautiful Gulf Coast where you can participate and a variety of activities. Some things in the area to do are go to the beach, visit Alligator Alley, visit the Gulf Coast Zoo, take a trip to State parks, or go Zip lining. You will be staying at a church in the area during this time. There is a $200 down payment to reserve your spot on this trip and it should cost around $350-400 in total. It's that time of year again! Habitat for Humanity, UW-Madison Campus Chapter is proud to announce their 20th annual Souper Bowl Fundraiser, the oldest and most successful fundraiser for the chapter. Join us for a soup dinner, courtesy of generous local restaurants, and enjoy entertainment by local artists throughout the evening. Raffle tickets will be available for the dozens of wonderful, donated prizes. The event cost $15 for a bowl and meal of soup, bread, salad and dessert, or $35 for two bowls and four meals. All proceeds go toward supporting Habitat-UW's 16th student-built house. Join us on Saturday, February 6th from 2-8PM at Madison West High School for a souper time! With the changing seasons comes the start to Habitat for Humanity- UW's fundraising opportunities. 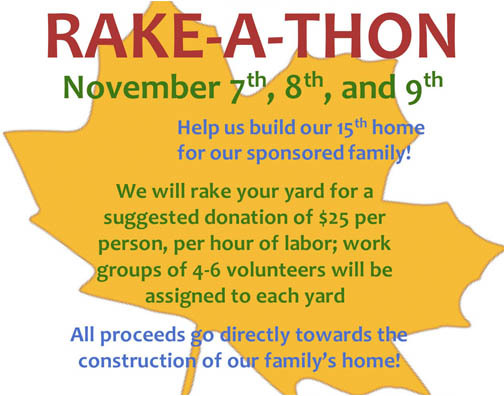 Sign up to have Habitat for Humanity- UW volunteers rake your leaves this fall season! Your generous donations will assist in funding our 16th student-built house. 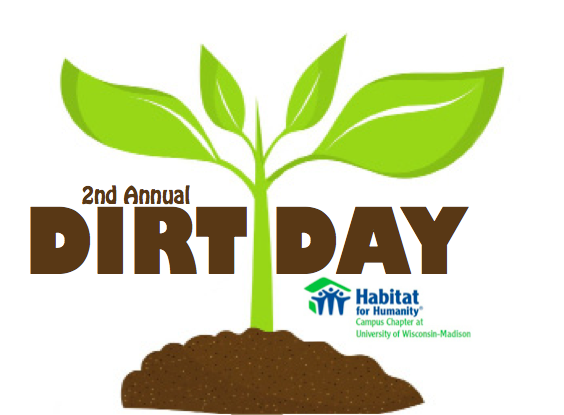 On April 17, 18 & 19th, Habitat for Humanity- Campus Chapter at University of Wisconsin Madison would like to invite you to participate in its 2nd annual Dirt Day Fundraiser! “Hire” Volunteers at a suggested donation of $25 per hour, per volunteer, to assist with spring yard work. Volunteers can help with mulching, raking, gardening; the sky is the limit. Donations from Dirt Day will help in building Habitat-UW’s 15th annual student-built house. Souper Bowl is Back this January 31st! Show your support for Habitat-UW at the 19th annual Souper Bowl! The event will be held from 2-8pm at Madison West High School, 30 Ash St. Enjoy an evening of donated soup, local entertainment, student-thrown bowls and raffle drawings. Cost is $15 for a bowl (meal provided of soup, salad, bread and dessert); or $35 for a family of four (two bowls, four meals). Larger and more decorative bowls are sold at a silent Pro Bowl auction. All proceeds go toward helping build Habitat-UW's 15th student-built home. Guess what Habitaters? We've finally gotten with the times! 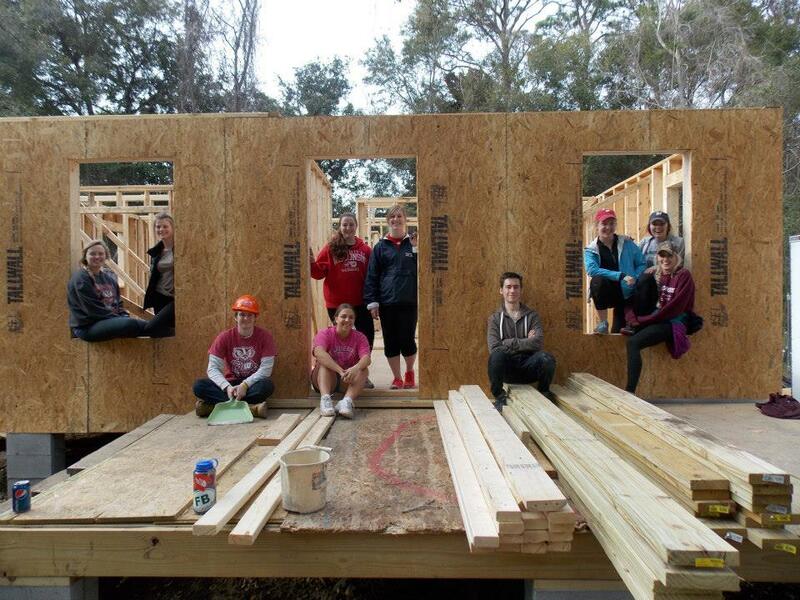 Like our page on facebook, called Habitat for Humanity, UW-Madison Campus Chapter. Then go follow is on twitter and instagram. Our handle for both us H4HUW. Stay up-to-date on all things Habitat and see all the cool things we do throughout the year! If You Build it, They Will RUN! Sign Up for Kickin' It! Copyright © 2016 Habitat for Humanity, UW-Madison Campus Chapter. All Rights Reserved.